Lesley Worner outside the new Vinnies Rockingham Shop. VINNIES WA will open a “bigger, brighter and better” store on Commodore Drive in Rockingham to provide an exciting new op-shopping experience for the local community. The new store will open on April 19 and the current Vinnies shop on Livingstone Road in Rockingham will close on April 10. Lesley, who has been a Vinnies Rockingham volunteer for three years, said she enjoyed volunteering as it gave her a sense of purpose and belonging. “Through volunteering I have an opportunity to see the generous donations given by our community raise revenue to help those in need,” she said. “Our team of volunteers are awesome and their ages and backgrounds are varied – we always have a laugh. Area Manager Sue Wilson said with the opening of the new shop, Vinnies will be looking for volunteers. “We need volunteers to help out in the shop who can assist with customer service, ringing up sales through the register and general merchandising,” she said. Ms Wilson said volunteers are trained in all areas of working in a retail environment including register operation, customer service, sorting, pricing donations and merchandising. 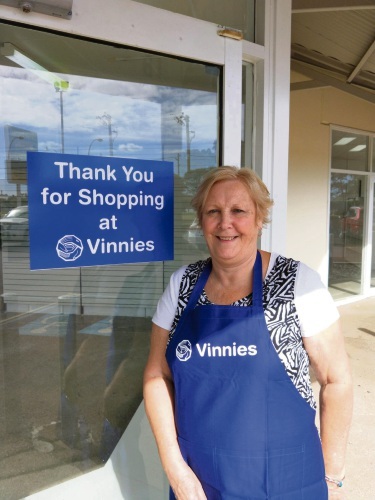 “Vinnies shops provide more than a retail opportunity, they are pivotal in providing welfare support to people who are doing it tough,” she said.